On Monday, June 11, 2018, Gov. Jerry Brown officially declared the month of June as LGBT Pride Month in California, a month already recognized across the country as a time to honor the lesbian, gay, bisexual and transgender community. Set in June to commemorate the 1969 Stonewall riots, considered a “tipping point” for the LGBT rights movement, “Pride” is a time to reflect on LGBT history and look towards the future. While celebrating the gains in social and legal acceptance since 1969, it is also important to acknowledge that this community’s journey to equality is far from finished. Many LGBT students face hostile school climates across the country. In a 2015 nationwide survey conducted by GLSEN, 55 percent of LGBT students reported that they had felt “unsafe” in schools in the past year because of their sexual orientation. A 2017 study found that that 75 percent of transgender students felt anxious or afraid to go to class. A 2017 report that conducted a meta-analysis of 20 years of data on school bullying found that LGBT youth are two to three times more likely than their peers to be physically assaulted or threatened in schools. An unwelcoming school climate leads many LGBT students to miss school, earn lower grades than their peers and experience mental health issues. Currently making its way through the Legislature is Assembly Bill 2153 (Thurmond, D-Richmond), which will require all public schools to annually provide in-service training to teachers on the availability of resources to support LGBT students who might be questioning their status. Current state law already requires the California Department of Education to assess if districts have provided information to school staff on community resources for LGBTQ students as part of its compliance monitoring. This bill formally requires training on those resources at least once a year. 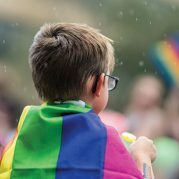 California Safe Schools Coalition — This broad coalition has published a variety of research briefs that focus on school safety issues for LGBT students. Gay Lesbian & Straight Education Network (GLSEN) — From research reports to professional development and lesson plans, GLSEN offers an array of resources centered around LGBT issues in K-12 education.